What does it take for a road to be considered dangerous? Well, for starters, there may be an increased chance of fatality on a particular stretch of road and a history of severe, persistent collision data. Low population provinces tend to have a lot of commuters who travel at high speeds down relatively deserted roads and conversely, some of the most popular provincial throughways also make this list. According to Transport Canada, someone in Canada dies on the road once every four hours. In this post, we’re going to look at some of the most dangerous roads and highways in the country. If you ever find yourself travelling down one of these notorious roads, please exercise extreme caution! If you frequent these roads, consider comprehensive coverage. Since 1990, at least 149 people have died on this two-lane highway. 125 of them were killed on a 240km stretch of road between Grassland and Fort McMurray in Alberta’s mid-north. The road itself has earned the nickname “Highway of Death” for these tragic reasons. For example, seven people were killed when two pickup trucks collided head-on on April 27, 2012. There were more than 1,000 crashes recorded on the highway between 2001 and 2005 – that's 250 crashes per year, and essentially one crash per kilometre. Regular users of this road claim that poor drivers make unnecessary road risks constantly, and residents have met to protest delayed highway improvements and unsafe driving. The Albertan government says that 40% of the collisions on this road involve animals. This stretch of Highway 401, a major highway artery in Ontario, earned the nickname “Carnage Alley” in the 1990s and remains one of the most dangerous parts of the province. This particular section of the 401 between Windsor and London is characterized by what CBC calls “a nondescript, boring agricultural landscape” that may cause drivers to lose attention and focus. One of the most well-known headlines (and the worst pileup in Canadian history) happened here on September 3, 1999; Labour Day weekend. An 87-car pileup left eight people dead and 45 people injured between Tilbury and Windsor. This was just after a summer that had “dozens of deaths near Carnage Alley” according to The Sun. There has been express demand for a median barrier, extra lanes and paved shoulders. On August 29, 2017, a pickup truck ended up crossing the centre median at high speed and crashed into a van carrying a mother and her child. According to Ontario Provincial Police data, this section of the 401 just east of Toronto has the highest record of traffic accidents in all of Ontario. On January 25, 2013, 80 vehicles collided along a 1.5km stretch of the busy highway, shutting it down for several hours. Five people were injured when snow squalls from Lake Ontario hit the highway. This highway is one of two main routes between the popular destinations of Montreal and Quebec City and it suffers from severe road deterioration. Let’s just leave it at this: in 2005, you may remember when a section of Autoroute 40 closed down for days after part of the road collapsed into a hole. Next, in 2012, a car flipped upside down when it hit a gaping pothole. The driver survived. This stretch of Highway 103, on the southern shore of Nova Scotia, earned a reputation no road wants: the deadliest in the province. Between 2006 and 2008, the road saw 29 deaths. Former Prime Minister Stephen Harper said that upgrading and improving the highway was of the highest importance in the province. In 2012, one passenger died in a single vehicle crash in December, while a month earlier, a driver died after a collision with a truck on the same road. As always, please exercise high caution on any major roadway, whether it's busy or not. 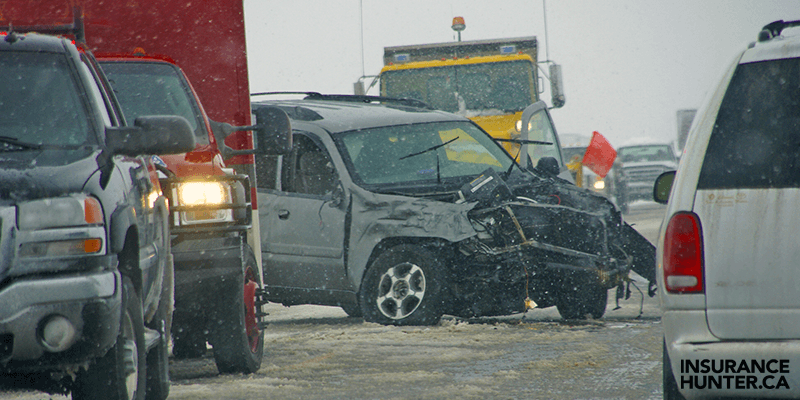 Minor collisions can turn deadly on these long roadways, especially when speed and driver inattention come into play.